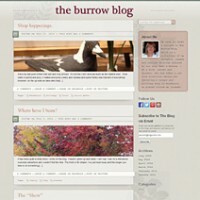 A blog made to compliment the Bundanoon Gift shop Nest & Burrow. Built with WordPress, the most easily installed and adaptable blogging platform. Jacki wanted a blog that was simple, yet elegant and easy to update and maintain. Primarily used as a means to share information about the shop, new products, what’s coming and even personal stories, the blog has attracted a number of loyal followers. A subscription service allows readers to sign up and to be informed of new posts.